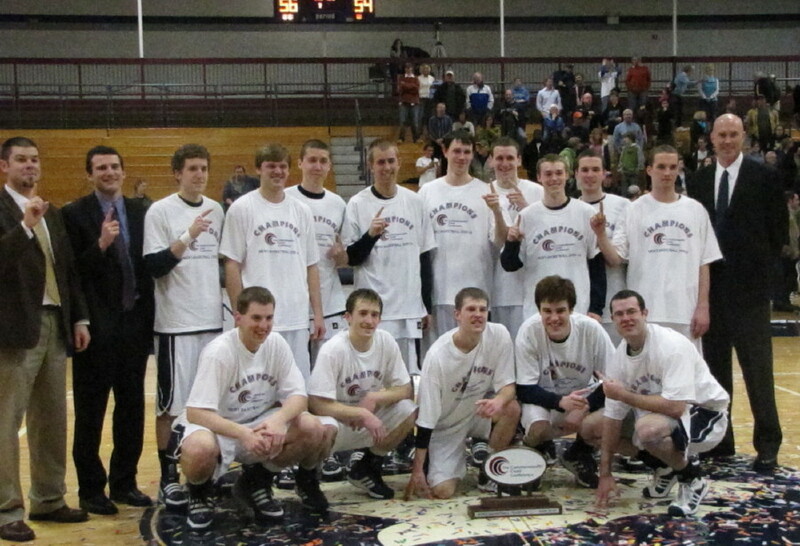 Andrew Locke (#31) pictured here with Greg Walker blocked thirteen Gordon shots to set a Middlebury record. (Middlebury VT) Unless a team wins the national championship, the season must end with a loss. Gordon got its final loss against Middlebury College (64-57) in the opening round of the NCAA Division Three tournament on Friday night at Middlebury. Andrew Locke (6’10” junior) had folks buzzing throughout the game with his school-record thirteen blocks. Besides blocking shots (to teammates), he also forced several Scot shooters to rearrange, and sometimes miss, what would have been easy inside shots against less dangerous defenders. Andrew’s shot blocking and intimidation will be the core of discussion as this game is recalled in future years. Gordon (24-5) never led in this one and had to rally back from double-digit deficits in both halves. That they did rally back doesn’t surprise any of us regular followers of this team. A ten-point run gave the Panthers a 27-14 lead with 7 ½ minutes left in the half. Against the #9 team in the country (according to D3Hoops) that could have been the beginning of a blowout but Gordon put an eleven-point run together to get back into the game. Greg Walker, Aaron Trigg, and David Dempsey provided the points as the Scots trailed just, 32-29, at the half. The game-deciding segment lasted 4 ½ minutes early in the second half, as the Scots were outscored 15-2 and trailed 49-34 with thirteen minutes left. 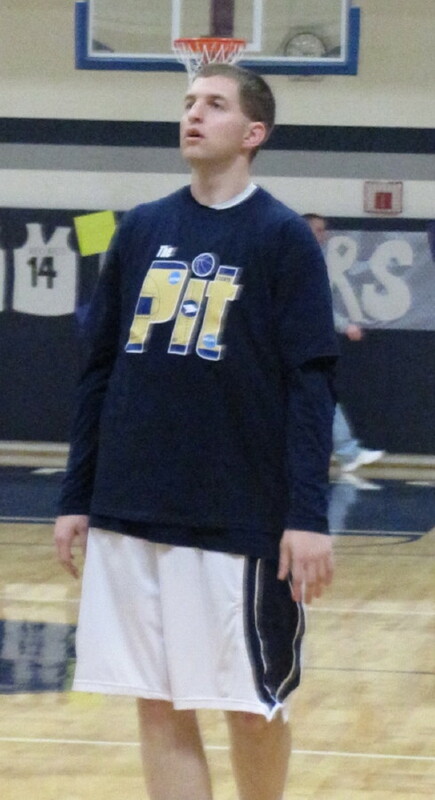 Freshman Nolan Thompson (17 points) had two treys in the middle of this Panther success. A couple of Middlebury students chanted, “Jesus loves us,” after the first trey. I’m not sure what they would have chanted if their team had the fifteen-point deficit. As in the first half, the Scots started the climb back into contention. This time they rode the hot shooting of Brady Bajema (16 second-half points) to close to 57-52 with 1:40 left. Gordon had the ball and a chance to get even closer but a steal and layin by Nolan Thompson clinched the outcome for Middlebury. Greg (4-for-15) had a tough night because he was defended by The Shot Blocker. Aaron (3-for-15) had it even worse. He was defended by two-time NESCAC Conference defensive-player-of-the-year Tim Edwards and on the times he beat Tim off the dribble he was confronted by The Shot Blocker. 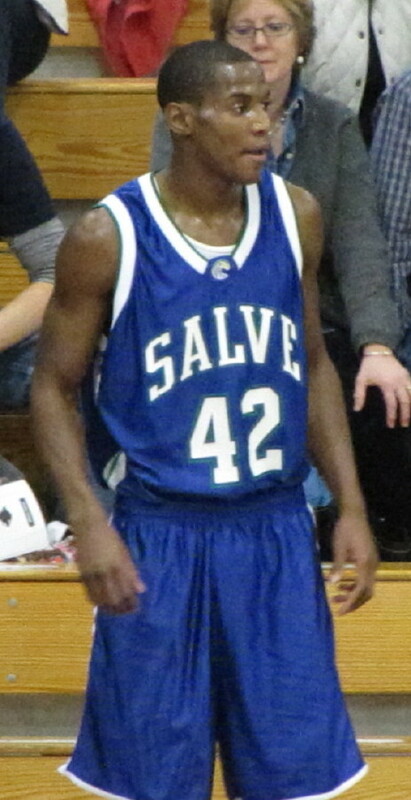 Tim Edwards, besides the defensive work, had eleven rebounds and twelve points. Charlie Gaskill, Rick Derr, and Tom Trigg watch the final minutes of their sons' last games. Plenty of Gordon folks made the 3+ hour trip to support the team including the President and his wife. The great turnout of parents was no surprise to any of us. The numerous interactions my wife and I have had with them have been a blessing. We’ll miss them. Is there a greater loneliness than to be badly outnumbered on the road and trail the entire game in front of a chanting crowd?? We have now seen the last of the basketball exploits of Aaron, Jeff, Timmy, Ben, and Brady. There were plenty of individual heroics over four seasons but the top memory for me of them will be their part in the win over Curry that finally captured the Commonwealth Coast Conference trophy. We now know that it can be done! Patti MacDonnell finds time to visit before the game. It was good to see former Gordon standouts Scott Allenby, Aaron Vogelzang, Ryan Smith, Andrew Ellrod, and Jerry Logan taking in the action. The future? Lord willing, I’ll resurface in November, curious to see what the 2010-11 edition looks like. Talk about holes to fill! Timmy MacDonnell - Defensive gem by the senior preserves Scot win in title game. Having now seen the video of those last 3.6 seconds, let’s look at what happened, at least as far as I could figure out. Brady had been covering Mark Mastrullo the entire game and Aaron had been covering Jarrell Jackson. During the final play, Aaron and Brady switched men because the two Curry players crossed so Aaron ends up with Mark in front of the Curry bench. Brady then has Jarrell. Meanwhile, Tim is on the other side of the lane with Mike Worrick on the weakside. As Mike Worrick drifts out toward the top of the key, Tim does not follow him but stays in the lane guessing at what Curry is up to. Jarrell Jackson fakes out and then cuts backdoor. Brady goes for the fake and Jarrell cuts backdoor cleanly. Philippe Jourdain reads the backdoor cut and throws a bounce pass under Ben Gaskill’s waving arms to where Jarrell will be on his way to the basket. However, Tim was already on his way into the passing lane as the bounce pass is released and intercepts the pass cleanly. He then plants his feet and lofts the ball into the backcourt allowing time to expire. Looking at the You Tube coverage, there’s no question that Jarrell was open and no question that the pass was to where Jarrell would have been in easy layup position. Tim’s play was remarkable under any circumstances but put it at the end of a conference championship game preserving a 2-point lead and you have to move into a different level of accolade. In the previous two tourney games, the Scots built up a comfortable lead in the second half and scared none of us in the end game. Against Curry (15-13), the “comfortable” second half lead was only eight points and it shrank to an alarming two points in the last minute. It’s never a good idea to let an opponent that is trailing by two points have the ball in the last few seconds. But the Scots did and thankfully, Tim MacDonnell stole the inbounds pass to preserve that narrow lead. With the victory, Gordon (24-4) gets an automatic bid in the NCAA tournament at a site and date/time to be announced on Monday. 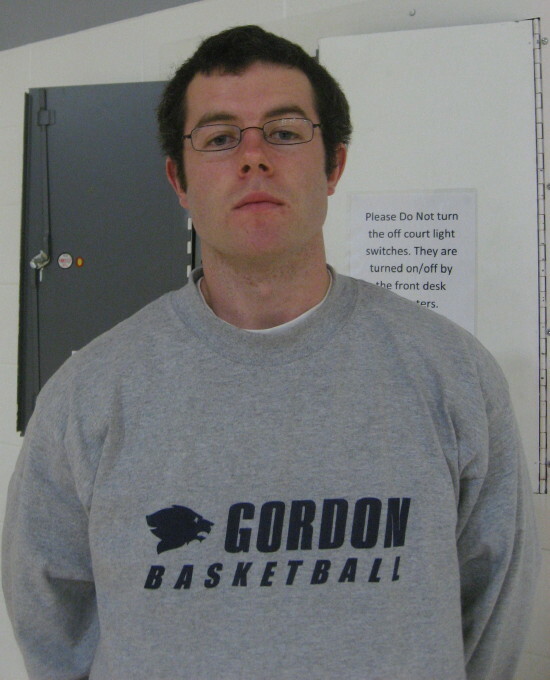 Gordon got an at-large bid at the end of the 2005-06 season and lost in their opening game to Utica (NY) at Worcester Polytech. The Scots took the lead for good with 12 ½ minutes left (40-39) thanks to two Brady Bajema (12 points/3 steals) free throws. That lead would be eight (53-45) with four minutes left and six (56-50) on an Aaron Trigg (10 points/5 rebounds) layup with 53 seconds left. After that, things got verrrrrrrrrrry interesting. Curry made a couple of shots (56-54) and then ended up with a frontcourt-inbounding situation with 3.6 seconds left. Many bad, for Gordon, possibilities were easily imagined. However, Scot defense saved the day as Brady and Aaron heavily defended likely shooters Mark Mastrullo (11 points) and Jarrell Jackson (11 points) and they weren’t open. Ben Gaskill (6-9) prevented the inbounds passer from attempting any sort of lob pass and Timmy MacDonnell anticipated the interior bounce pass, stole it, and had the good sense to lob the ball down the court to let the clock run out. 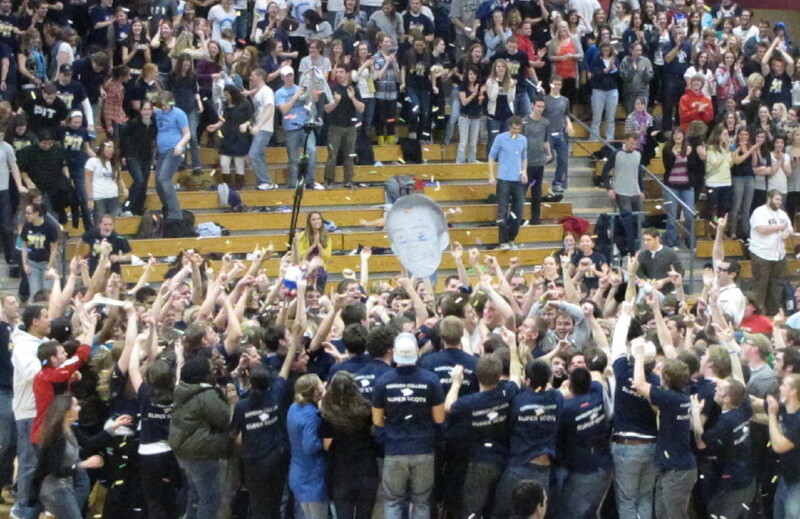 As the buzzer sounded many of the Gordon faithful raced onto the court to congratulate the 2009-10 CCC champions. Others just stood there in disbelief savoring the moment and trying to quell an accelerated heart rate. This was the eighth straight appearance for Gordon in the CCC tournament. The first three years they lost in the first round. The next four years they lost in the second round. This time around, they overwhelmed Endicott and Colby-Sawyer in the first two rounds and then hung on for dear life in the championship event. The Gordon crowd was loud and persistent and their part in spurring the Scots on over the last three tourney games can’t be underestimated. The Scots had an off game shooting, something that three games in five days, as well as practicing at Endicott on Friday instead of at the Bennett Center because of the power outage, will do to you. However, defensively the work Brady and Aaron did on Jarrell Jackson and Mark Mastrullo was key to this win. Gordon can be thankful that neither of those Colonels had a shot at the basket in the crucial final play. Curry led in the early going but a David Dempsey (10 points/5 rebounds) layup assisted by Jeff Derr gave Gordon its first lead, 14-13, with 7 ½ to go in the half. 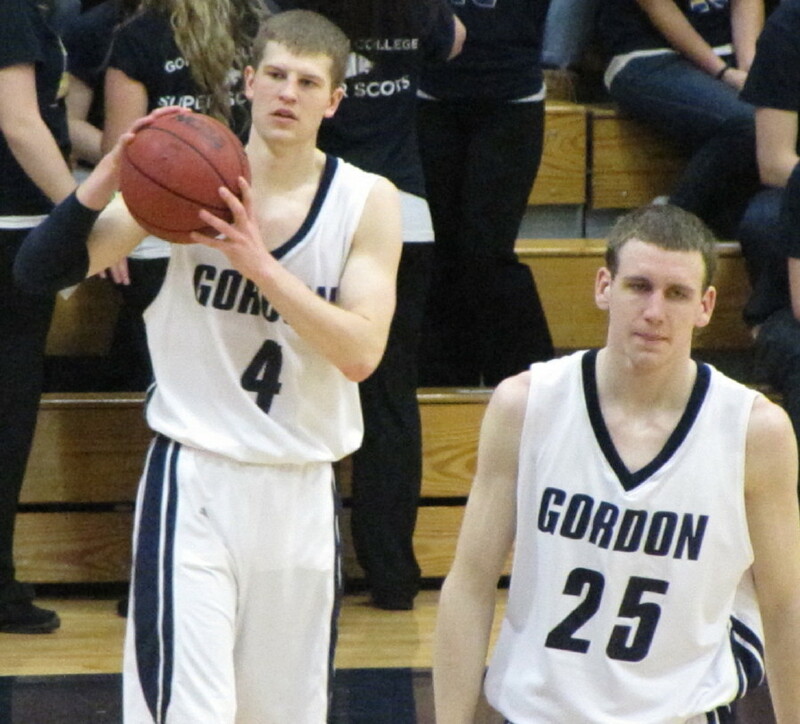 It took a couple of inside moves by Ben Gaskill (9 points/12 rebounds) late to give Gordon a slim 25-24 halftime edge. Early in the second half Curry put together a six-point run including a difficult layup by 5-7 Jarrell in traffic to build a 37-33 advantage with 14:50 remaining. But shortly thereafter Gordon put Curry in a hole that they couldn’t dig out of. Over a four-minute span, the Scots went on an eleven-point streak and grabbed an 8-point edge (47-39 – 8:52 left) that Curry spent the rest of the game unsuccessfully trying to overcome. During this run, the points came from David Dempsey (5), and two each from Jeff Derr, Tim, and Brady. The Colonels turned the ball over three times during this crucial sequence. 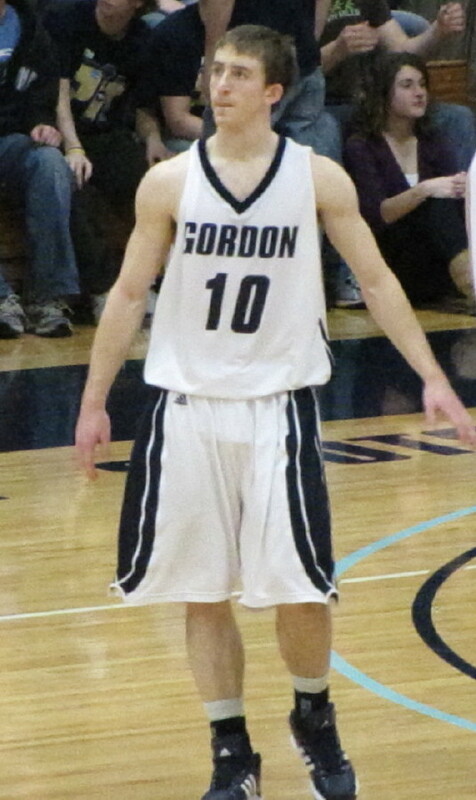 The final stats enabled several Gordon players to make progress on the All-Time lists. Brady has moved ahead of Scott Beebe (1123) into 14th place in the all-time scorer’s list with 1132. Ben is now third in the all-time rebounding totals with 566 putting him in front of Mike Herr (559). Greatly appreciated was the rendition of the national anthem by a Gordon student. I’m a fan of having everyone sing it. It will be a while before I get over all the happiness and relief winning the CCC championship provided. I will never cease marveling over the commitment parents from near and afar make to be on hand for these special moments. (Wenham) What a game! The efficiency of the Scots on both ends of the court, combined with the sixth-man level crowd made this a memorable evening. It also got Gordon (23-4) past the semifinal CCC tourney hump that had eluded them during the past four seasons. 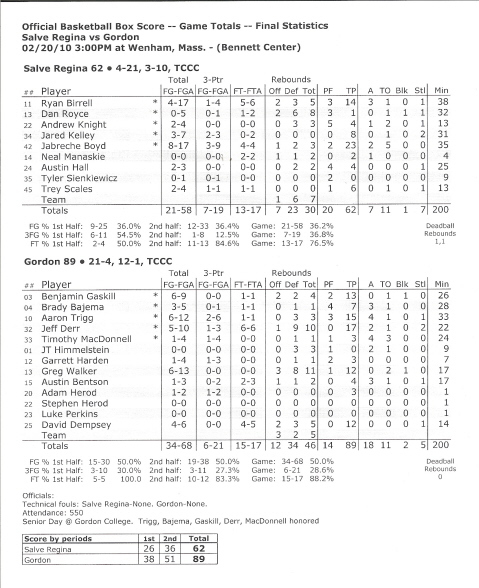 Gordon reached the unfamiliar finals of the Commonwealth Coast Conference tournament with their, 77-58, win over Colby-Sawyer (15-12) at the Bennett Center on Thursday night. This was the eighth straight CCC postseason for the Scots but just the first time getting to The Big Game on Saturday night. 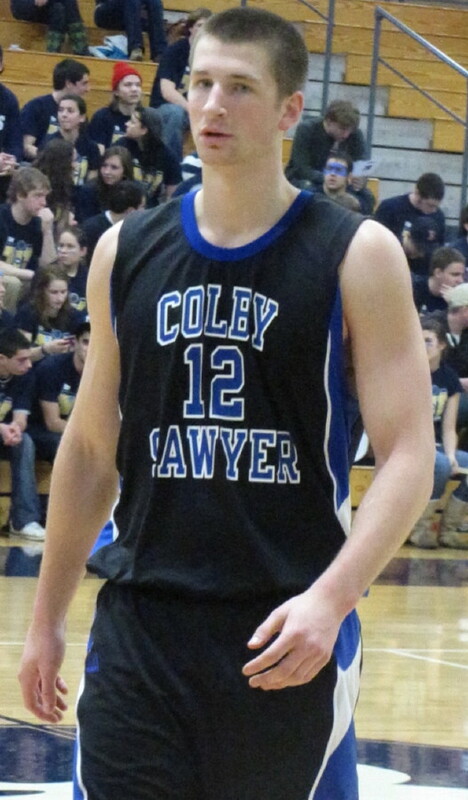 Last season Colby-Sawyer ended Gordon’s season in the semifinals up at New London, but not this time. The Scots took an 11-9 lead, 4 ½ minutes into the game on Aaron Trigg’s 3-pointer and never trailed the rest of the way. The Gordon offense was consistently good (51% field goal percentage) from just about everywhere. Aaron Trigg (27 points), Greg Walker (20 points) and Brady Bajema (16 points) led all scorers and gave the normally tight Charger defense fits all game. Aaron had the long-ball going (5-for-7), made ten free throws and handed out five assists. Greg picked up his defense on Jason Chevrefils (he had 19 points in the earlier CS win) and hit short jumpers to avoid the double-teams he faced when getting the ball closer to the basket. 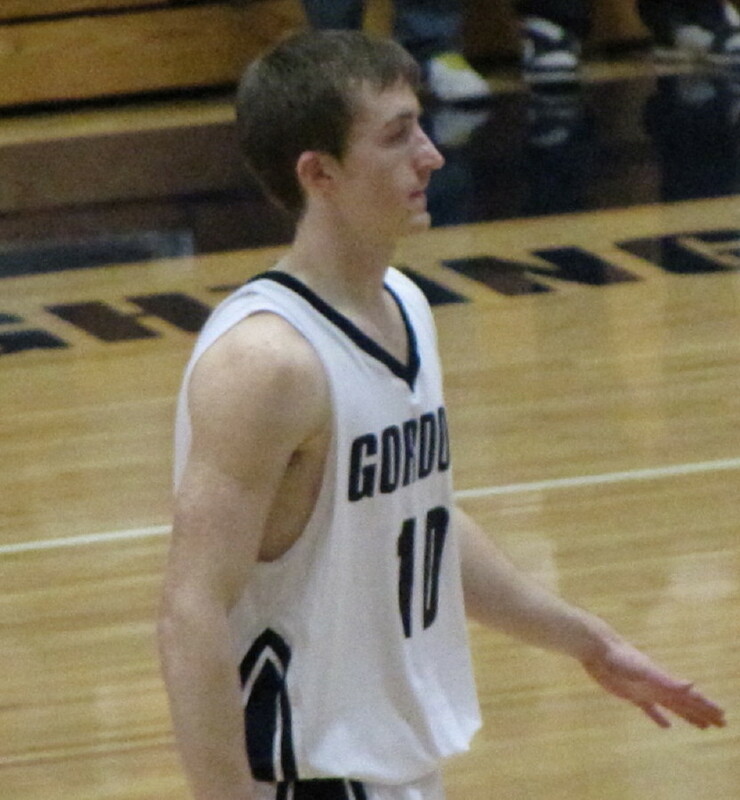 Brady took the ball to the basket more than he has all season, made seven free throws and dished out seven assists. Gordon’s defense was excellent as well. The CCC’s co-defensive player-of-the-year (Ben Gaskill) combined with Tim MacDonnell to stymie Jon Chaloux – top scorer in the CCC with 18PPG. The last-game Charger suffered through a four-point game going 0-for-8 from the floor. Ben also had ten rebounds. 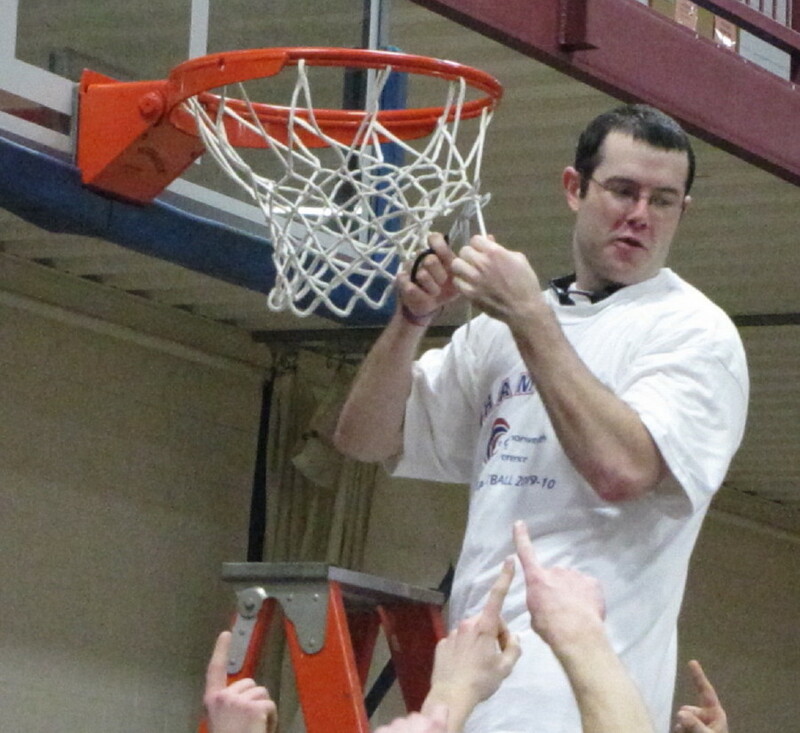 Similar to the Endicott experience on Tuesday night, there was no history to suggest that Colby-Sawyer didn’t have the coaching, players, and big-game experience to give the Scots a bad night. They had beaten Gordon three straight, including a 90-64 rout last February at the Bennett Center. The Chargers were as close as 32-29 in the first half and the Scots lead at halftime was a very uncomfortable, 36-31. The Scots came out in the second half unaware, apparently, about what was supposed to happen and built the lead to 43-32 in the first three minutes. Twice Gordon broke down CS’s interior defense with Greg Walker as the finisher. The lead was still double digits (51-41) with 13 ½ minutes left before Corey Willis nailed an NBA range trey to instantly cut the margin to seven. The worrywarts from the Endicott game now resurfaced at the Bennett Center. But Aaron answered with a 3 of his own and started Gordon on a 13-2 point spree over seven minutes that made things 64-46 with 6 ½ minutes to go. Aaron had a couple of threes, Greg had a couple of layups, and Brady had three free throws. Things got a bit dicey over the next two minutes as CS ran six straight but the Chargers would get no closer than twelve the rest of the way. Brady and Aaron combined for 9-of-10 free throws in the end game. The Gordon crowd has been spectacular in both games. They chose to give Charger freshman Corey Willis special chanting attention and he ended up shooting just 3-for-12. The only negative I heard from The Pit was their late-game chanting of “over-rated” in senior Jon Chaloux’s direction after he fouled out of his last game. Earlier that chant made sense but not when an excellent player has just ended his career. 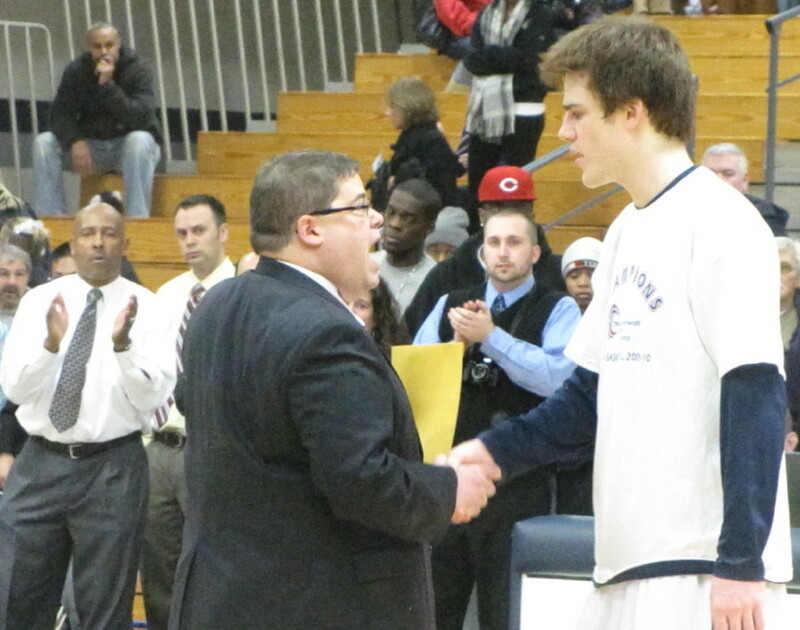 In the same vein, it was classy of Aaron to step away from the foul line late in the game and applaud CS senior captain Dave Rosso when he exited for the final time. The Curry Colonels (15-12) will be the Big Game opponent Saturday night. They have been in the Big Game three of the last four years winning two years ago. 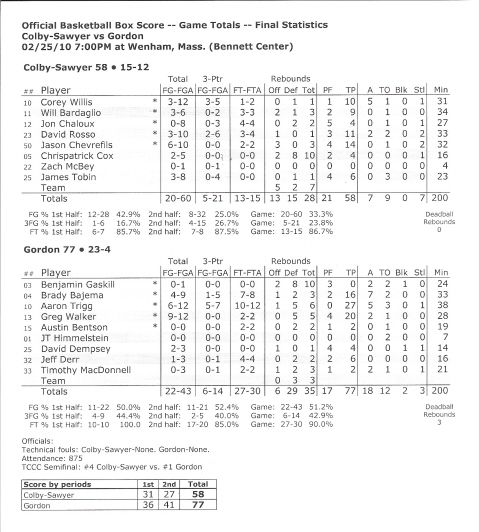 Gordon defeated Curry, 74-68, in Wenham on January 23rd. In that one, the Scots had 26 turnovers (all-time high?) but nailed eleven 3’s. Curry features two CCC first-teamers – Jarrell Jackson and Mark Mastrullo. 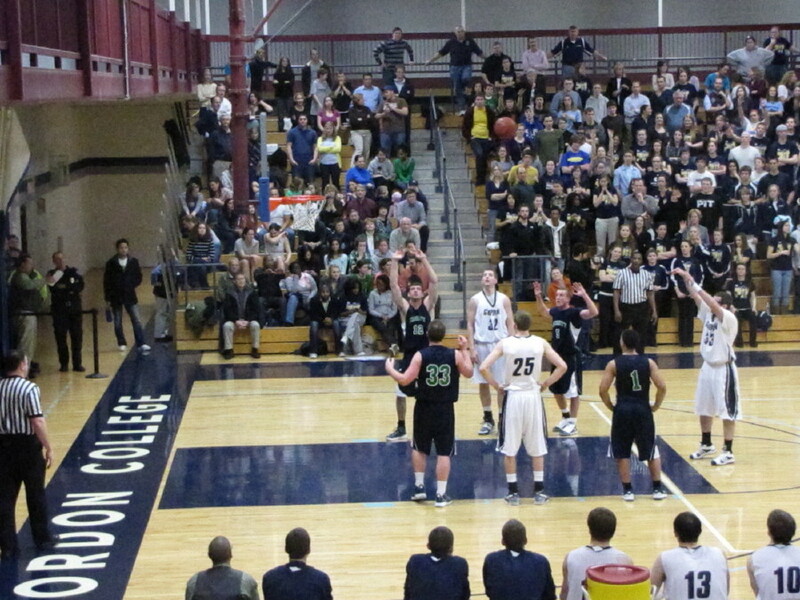 Tim MacDonnell launches a free throw during the closing minutes of Gordon's defeat of Endicott. 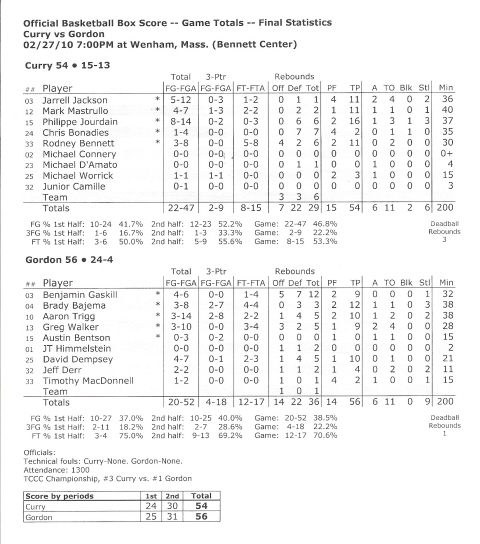 (Wenham) Gordon (22-4) cruised past Endicott (12-13) in surprisingly easy fashion, 73-52, before a huge home crowd to win the opening round of the Commonwealth Coast Conference tournament on Tuesday evening. The win puts the Scots into the Final Four for the 4th straight season. 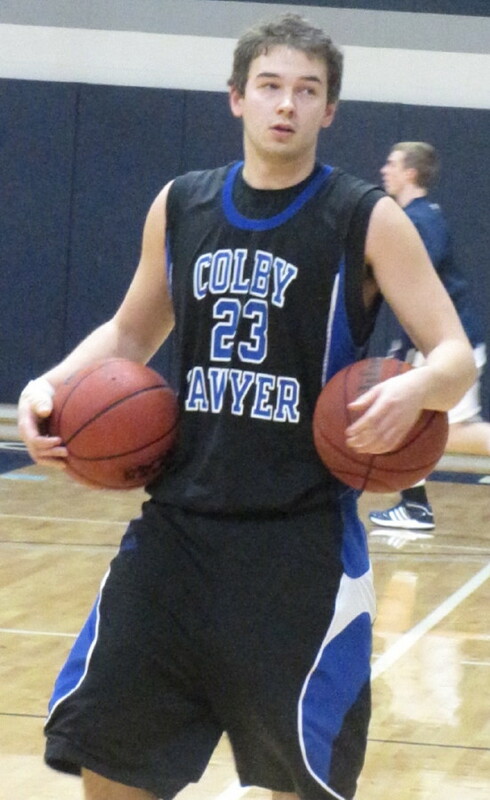 Thursday night the opponent will be Colby-Sawyer which did a number on Nichols (82-65) tonight at home. 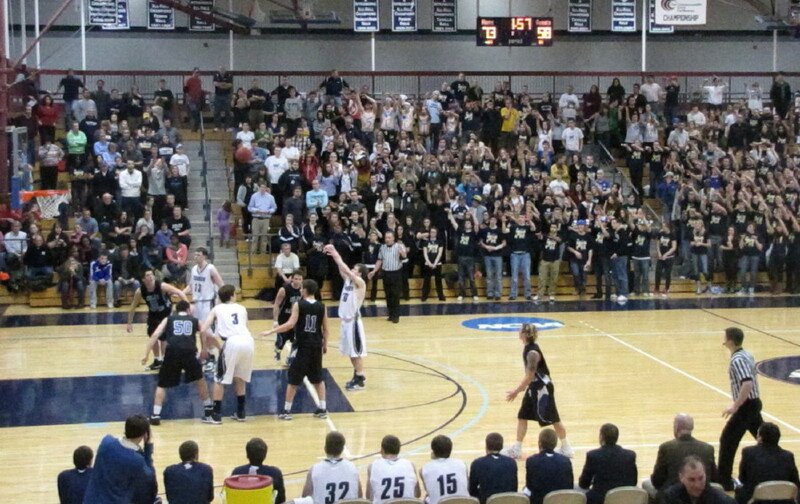 Thursday’s game is at the Bennett Center (7PM) and hopefully the same supportive crowd will be on hand again. For this game, I saw sections of stands opened up that I didn’t know existed and there were students filling them! Gordon/Endicott games in recent years are always close. In two meetings, the teams split the results. Endicott broke a tie in the last minute in December to win at the Bennett Center. In late January, Gordon broke a tie in the last two minutes to win. That’s why this one was so surprising. Gordon took the lead midway through the first half (13-12) on a JT Himmelstein trey and never trailed thereafter. A 9-2 run over the final three minutes of the half put the Scots in front, 33-21, at halftime. Gordon’s last three points came from a how-many-times-have-we-seen-this corner shot by Aaron Trigg on a pass from Brady Bajema. Again, those familiar with the rivalry expected some sort of Gull response in the second half but after Mike Rhodes’ layup cut the halftime lead to 38-27 the Scots rattled off seven straight. Now the Gulls were in serious trouble, 45-27, …………. but fifteen minutes were left. However, even the worrywarts in the crowd began to relax several minutes later after Gordon exploded for thirteen straight to put this one away, 65-36, with 4:40 remaining. Jeff Derr started this run with a crowd-pleasing breakaway jam. Brady also came up big in this stretch with a trey, two assists, and two foul shots. The Gordon defense was extraordinary from beginning to end. Brady shut down Graham Whitelaw (12.5 points per game) completely. For that matter, Endicott didn’t have anyone score in double figures. The CCC released information today that most of us already knew – Aaron (Player-of-the-Year) and Brady (1st team All-League) are terrific players. Aaron led all scorers with 16 points and in the process moved past Steve Heintz into 4th place on the all-time Gordon scorers’ list with 1546 points. Brady had five assists to go with 14 points. The CCC’s best free throw shooter connected on 11-of-12 attempts. I already mentioned the defensive job he did on senior Graham Whitelaw. Endicott limited Gordon’s 3-point looks but the Scots found openings in closer to the basket as a result. 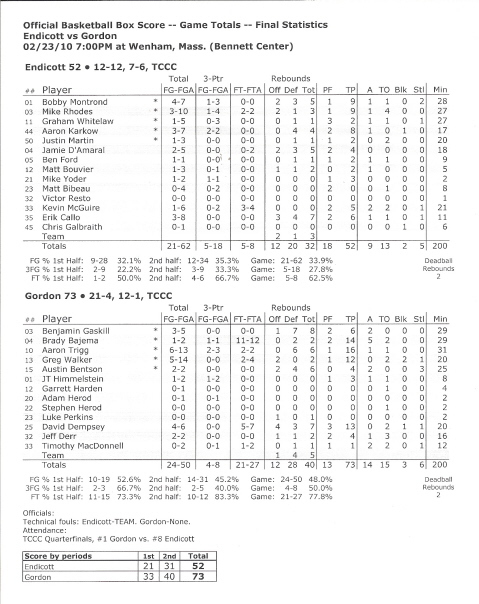 Endicott used full-court pressure but Gordon reacted well to it especially in the second half. During that half the Scots had six turnovers but two of the them came in the last 1 ½ minutes when reserves from both squads filled the court. The Gulls were not helped by the fact that freshman starter Lance Greene was unavailable because of a foot injury. Andrew LeClair, one of Colby-Sawyer’s all-time greats, now an assistant coach, was in the house taking notes. Gordon is back in the Final Four for the fifth straight season. Twice in the past four seasons, it has been Colby-Sawyer ending Gordon’s season. The Chargers were the last team to defeat the Scots this season (74-63 at New London on February 9th). I know, what’s the good news? Gordon is playing at home and coming off a wonderful win over rival Endicott. The Endicott turnout must have been impacted by the fact that the Gull women were playing at the same time at Endicott. Some of the Gull fans on hand probably wished in the second half, as the Endicott deficit mounted, that they had stayed home too. (Wenham) Plenty of where-did-the-time-go moments as each set of five parents paraded out to midcourt with their son on Saturday afternoon at the Bennett Center. 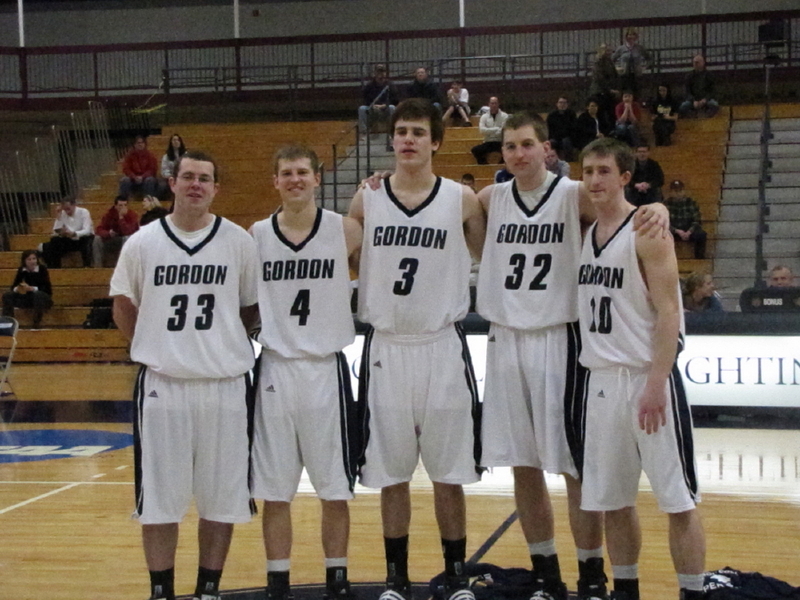 The five seniors then became the game starters for Gordon (21-4/12-1) and played big roles, as usual, in leading the Scots to an 89-62 win over Salve Regina (4-21/3-10). Gordon had clinched the top spot in the Commonwealth Coast Conference several games ago. The real down-to-the-wire action today was sorting out the five teams below Gordon, Wentworth, and Curry in the standings. Five teams in that group ended up with six losses. Today’s results have Gordon’s first round opponent at the Bennett Center at 7PM on Tuesday to be Endicott. Other teams in our bracket are Nichols and Colby-Sawyer. Hey, who said this would be easy. Let’s return to the game I’m supposed to be telling you about. The atmosphere was relaxed. It had the feel of an exhibition game with a lot more open shots than usual. Gordon, in fact, put up a season-high 68 shots and made half of them. Many of the Scot opportunities were of the high-percentage, in-close variety. Jeff Derr (17 points/10 rebounds) used his first start of the season to register his first ever double/double. Greg Walker (12 points/11 rebounds) collected a similar double/double. Both big men benefited from size advantages but it was the Seahawks weak interior defense that really hurt the visitor’s chances. SRU played Brady Bajema (7 points/3 assists) and Aaron Trigg (15 points/4 assists) man-to-man and tried to zone everyone else. This arrangement left many inside opportunities for the unselfish Gordon offense and in this game, the Scots cashed in regularly. For ten minutes, though, this looked like a game that the Scots could lose. The Seahawks were hot from the outside (four 3’s including two by Jabreche Boyd) and SRU had a 16-14 lead. The next 6 ½ minutes were a Gordon delight as six different players helped the Scots run off seventeen unanswered points and end up with a 31-16 advantage. The damage was done from in close except for Tim MacDonnell’s trey. The halftime lead was 38-26. The Seahawks were very competitive for the first ten minutes of the second half as well. Jabreche Boyd (game-high 23 points) and Ryan Birrell (14 points) were the primary scorers for SRU as the Gordon lead was just 57-48 with 10:17 left. Gordon, however, put the game away over the next 3+ minutes on free throws and layups from six different players during a 13-3 segment to move the Scots to a more relaxed, 72-51, advantage. There was a 10-point run further along and opportunities for each senior to be replaced to rousing ovations. 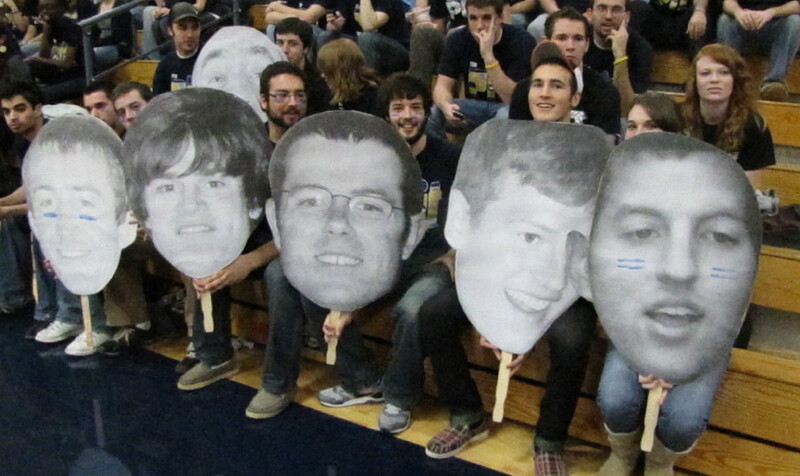 The crowd was enthusiastic and sported pictures of the seniors. 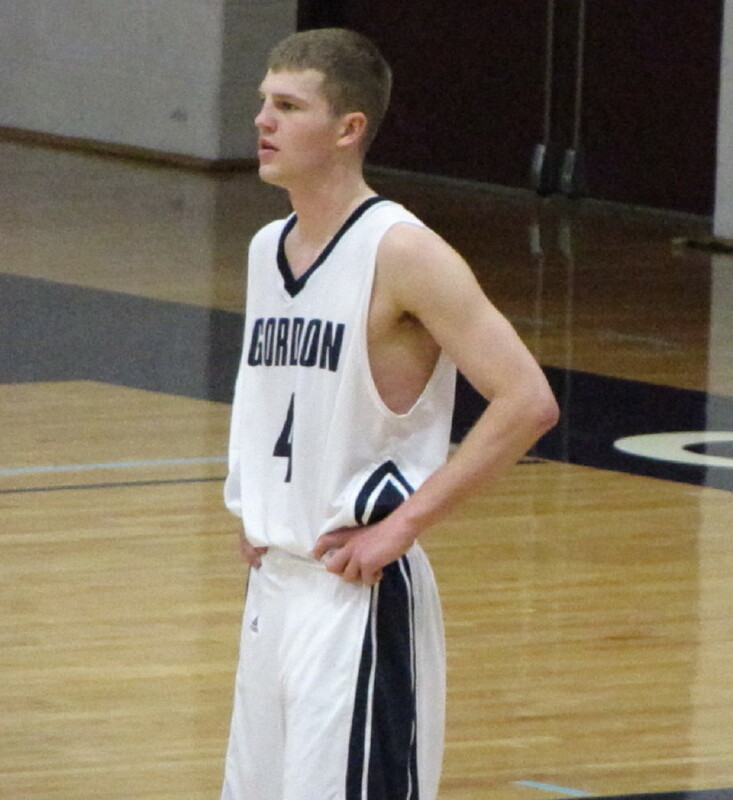 Ben Gaskill added some offense (13 points) to another fine defensive effort. This time his defensive work limited Dan Royce (16.5 points per game) to one point. Adam Herod came in late and put up his first points of the season. Brady’s last basket gave him 1090 points and put him into 15th place on the all-time scorer’s list ahead of Justin Kaufman (1088). Aaron’s fifteen points gives him 1530 and puts him within range of fourth all-time scorer (Steve Heinz) who has 1545 points. Gordon had its best game of the season as far as turnovers go, committing just eleven. SRU did do some pressing. Gone now, is the relaxed atmosphere of the last few games. Now teams get to feel either the “thrill of victory and or the agony of defeat.” I would like to be “thrilled” at least through next Saturday! The last four seasons the Scots have defeated Nichols, Salve Regina, Wentworth, and Roger Williams in first round games.